With its minimal, sophisticated design this suite is the result of a collaboration with the fabulous team at Martha Stewart Weddings. 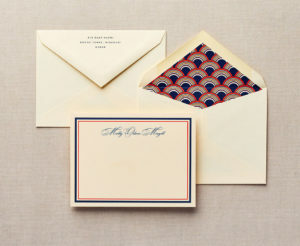 Each invitation is hand tied with black thread for an extra special touch. For 100 sets, pricing starts at $12.50 per set for Flat Printing, $20.50 per set for Flat Premium and $23.50 per set for Letterpress Printing.